Watercolor on pieced paper, 33 x 45 in. Last Monday—(May 22)—to Zoar Valley to make a painting of the old Gothic (Lace Gables) House [the same house seen in Lilacs, No. 2], with the lilac bush in bloom (as I have wanted to do ever since I first discovered it on a mid-May walk from Gowanda to Springville, back in 1930). The lilacs were at the most enchanting stage, that is, partly open, so that the general effect of the color was an incredibly rich reddish lavender, which in juxtaposition with the peculiar hot orange-brown of the wood under the eaves, the gray-violet sides, the dull olive roof, and the raw rank greens in the lawn, became almost bizarre, or lurid in its intensity. . . .
A good part of my interest in the subject was its strange assembly of local colors, so much so that perhaps I slighted forms and expression a little. . . (Burchfield journal, May 27, 1939, as quoted in Townsend, ed., op. cit., p. 488). Most important “art work” I have done is to get out the “Lilacs” No. 2, and study it. The house seems very well worth preserving, but all the rest I scrubbed out as completely as I could. 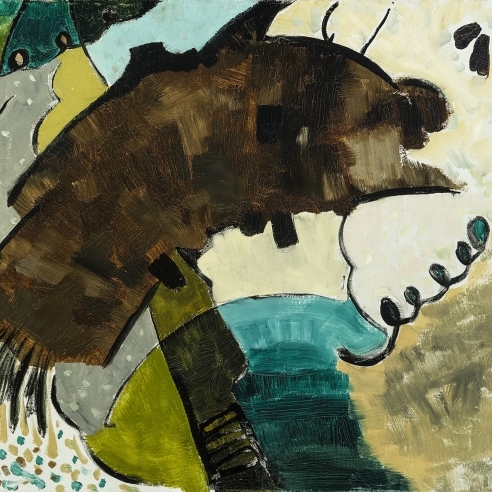 I cut two inches off of the top, and right side each, and it now seems capable of becoming something (Burchfield journal, May 31, 1939, as quoted in Townsend, ed. op. cit., p. 489). 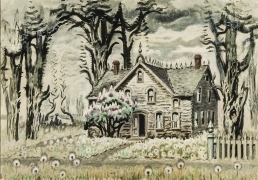 Burchfield reworked Lilacs, No. 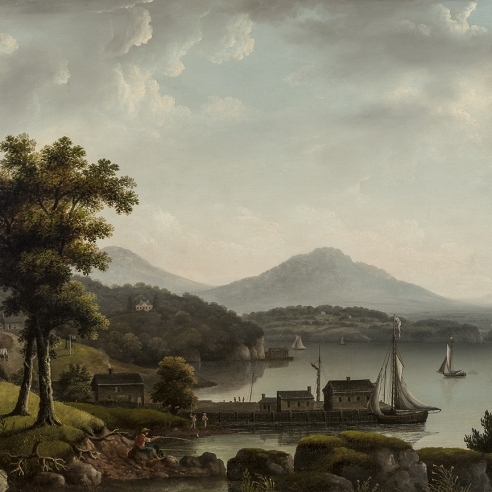 2 extensively over several decades, often cutting away portions of the original paper and adding new sections several times, something he did frequently with his larger pictures. The center sheet—the “core”—of Lilacs, No. 2 is related to another, somewhat smaller watercolor, Lace Gables (1935, Munson-Williams-Proctor Institute, Utica, New York; see: Townsend, ed., p. 488 illus. 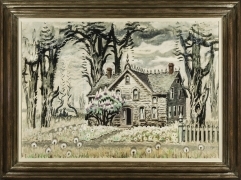 ), which features the same house from Zoar Valley, one of Burchfield’s favorite sketching spots along Cattaraugus Creek, located approximately twenty-five miles south of Gardenville, New York.